Award-winning poet Renée Saklikar and renowned composer John Oliver join forces to create an immersive experience of soundscapes interwoven with poems from Saklikar's long poem children of air india: un/authorized exhibits and interjections. about the bombing of Air India Flight 182. The raw voice of the poet is the instrument for a new sonic journey. This work is being released to coincide with the 30th anniversary of the bombing of Air India, June 23, 2015, as a memorial to the dead. In the fall of 2012, Rick Carswell introduced Renée Sarojini Saklikar to John Oliver and suggested a collaboration, and invited them to perform at the 2013 New Westminster Literary Festival. Oliver was immediately taken by Saklikar's collection titled children of air india: un/authorized exhibits and interjections: here was a mixture of voices and styles, the elegiac juxtaposed alongside reportage, dramatic monologues, and personal stories. Oliver’s collaboration with Saklikar resulted in the creation of sequences in the work now referred to as Tropes 1 and 2, in which the composer captures the poet's words and replicates them; transforms, recombines, distorts, and extends them to create sonic symphonies out of words. 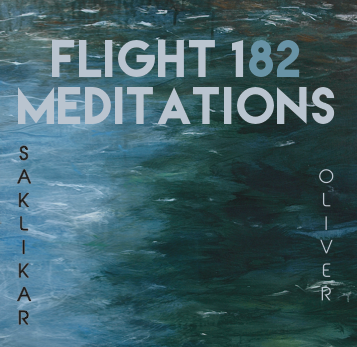 Public accord spurred Oliver and Saklikar to create this now one-hour long work that spans the simple accompanied poetry reading to the complex manipulations of the Tropes. Oliver's previous work on themes of collective grief finds new expression here, employing a mixture of filmic and documentary techniques with contemporary immersive sound processing. "My objective", the composer says, "was to create a reverberation of meaning that often occurs in the mind of the reader as they absorb a poem in solitary reflection. So as words and sound reverberate and intermingle on reading, I have created such reordering in my sonic creation, going further, to present the listener with heretofore unheard-of new sounds and meaning.